Call it our summer vacation. Call it flakiness. Whichever. With both of us having new busy jobs, trips out of town, etc., turns out we’re just not as disciplined as some of our blogger cohorts in keeping up. But hopefully that will change. 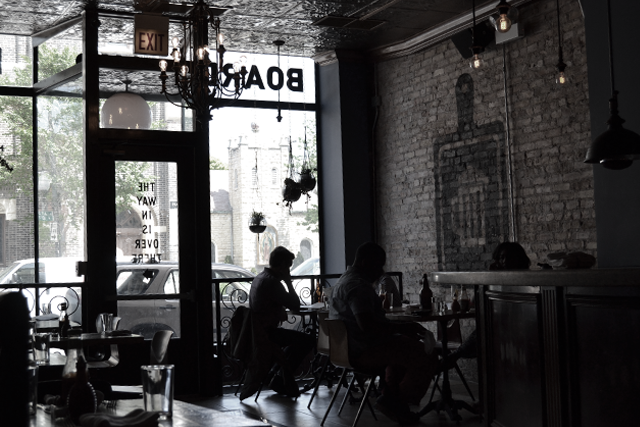 Since we haven’t chatted much lately, we hope you’ll excuse us as we’re REAL bold for a minute: Dusek’s in Pilsen has become one of our favorite new brunch spots. Dusek’s decor is like that apartment you’ve always wanted to live in. Vintage details intermingle with sleek, modern furnishings. And we can help but love the place settings. It’s a mismatch of plates, silverware and glasses that might have come together by pooling all of our grandmas’ collections together. We mean that in a good way. This bloody rocks. It’s the kind of great tasting bloody mary that’s so well balanced that you can’t really pinpoint the ingredients. 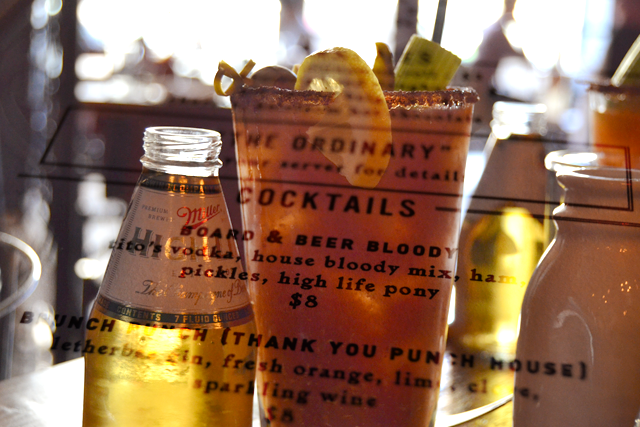 Horseradish does make a big play in this one, and we can’t resist a bloody that comes with a High Life pony. Beermosas are phenomenal as well. They’re not your average Belgian beer with a splash of orange juice. They’re full-on premium cocktails. Try the Apple Beermosa that tastes like drinking a refreshing granny smith apple or the Ginger Beermosa that’s basically a beer-based Dark and Stormy. The food is incredible as well. First off, you can have oysters. Second, the egg dishes are rich and savory without being too over the top. 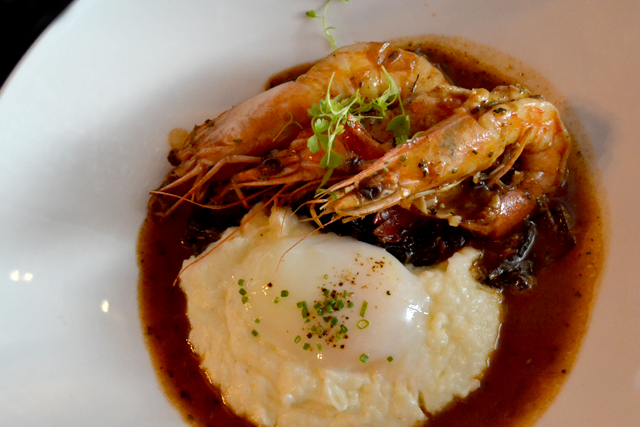 Standouts we enjoyed were the BBQ Shrimp and Grits and the 3 Ham Eggs Benedict on House Sourdough. If you’re craving a burger, the Juicy Lucy is pretty great. 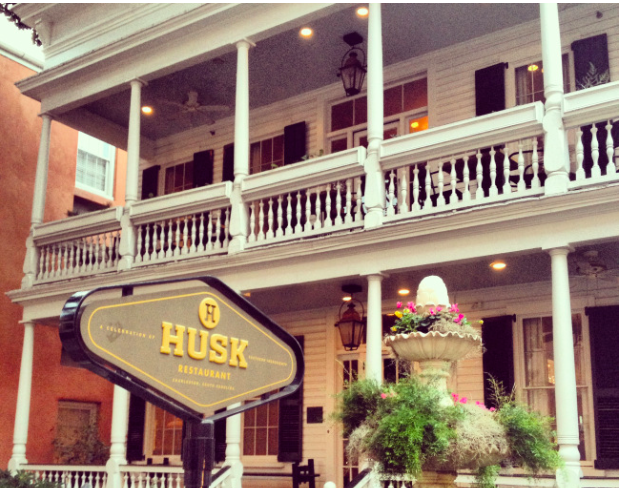 You might be interested to know that its sister restaurant Punch House below Dusek’s apparently serves delicious punch on tap. We haven’t been there, but we’re dying to. While any two are hardly alike, we’re always looking for ways to mix up the bloody mary. Literally and metaphorically. It’s summer. It’s (sort of) hot. Why not enjoy your favorite bloody in solid form? Or icy form? Genius ideas we only wish we could take credit for. 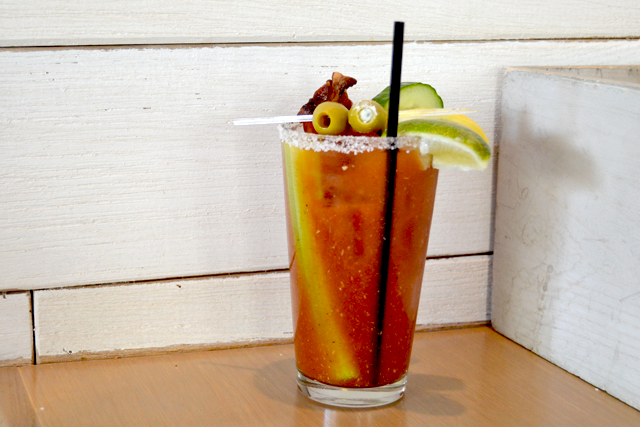 Without further ado, we leave pay tribute to the bloody mary lovers who tried it first. This is bloody effing genius. We imagine this would be the talk of any outdoor brunch or early afternoon summer BBQ. There are a handful of variations on the Pinterests, but we’re most intrigued by this variation that is made with ginger-infused vodka, fresh ginger, limes and even celery sticks. If we make nothing else new this summer, it’s got to be this. We recently discovered the slightly savory Negroni slushy at Parson’s (at least the other half of us did). Quickly do you remember the brain freeze you used to get when you were a kid. Except this time with booze. We’re intrigued by this frozen version of our favorite drink. Let the slushy obsession continue. 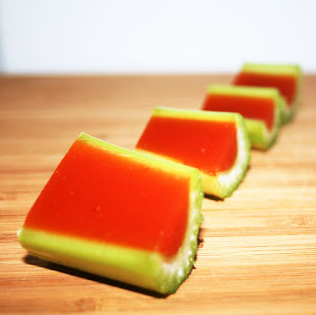 No two words evoke painful hangover flashbacks quite like “jello shots.” This version seems slightly more grown-up and sophisticated than the Dark Eyes-filled strawberry ones you slurped down on spring break of yesteryears. It even includes celery. That means it’s healthy, right? The summer’s already half over, and we clearly have more work to do. Like post more often. Slackers. 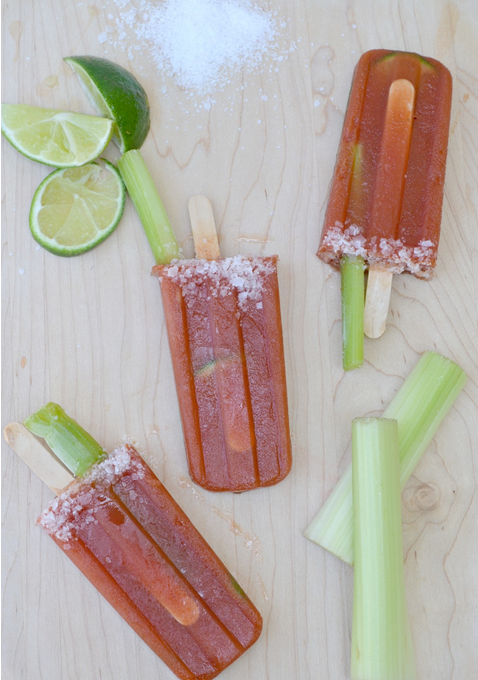 Tell us if you happen to try one of these ice cold summery concoctions. Until next time! 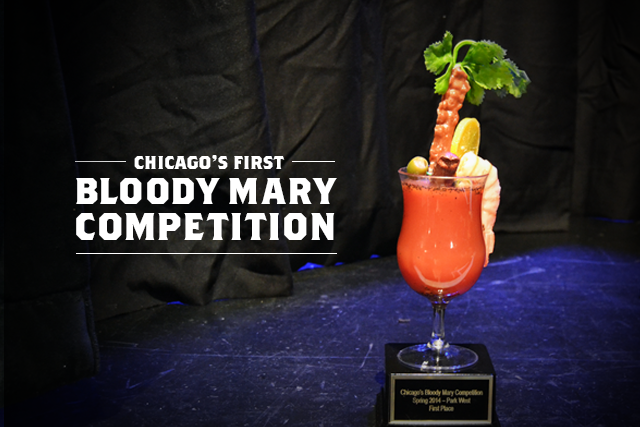 As you may recall, a few months back, we partnered with Thrillist to bring you Chicago’s 10 most ridiculous bloody marys. 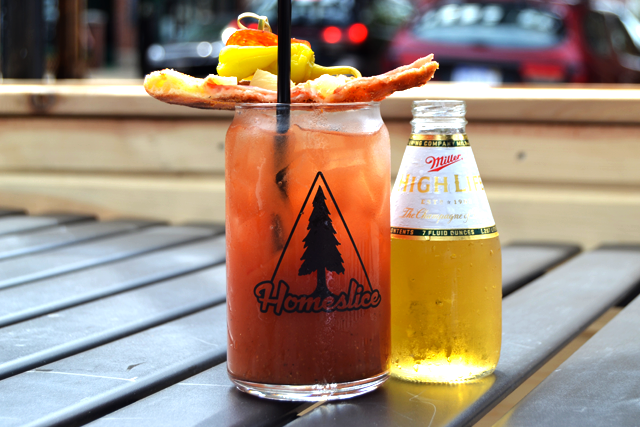 On that list was the “Bloody” at Homeslice, an oversized bloody mary that comes topped with a cold slice of Hawaiian pizza, pepperoncini and pepperoni. Well, we love bloodies. And cold pizza—even when we’re not hungover. Who doesn’t? We had to give this one a try. We didn’t brunch at Homeslice but this dashing combo provided the perfect afternoon snack. First things first, we couldn’t help but chuckle when the server asked us if we wanted a “Low Life” to accompany it. Errr, you mean a High Life pony? Beyond the pizza garnish, the bloody itself is quite delicious. Not too spicy, but just right, with notes of celery salt. While the bloody mary was tasty, the cold pizza garnish stole the show. The sweet pineapple tangoed with the saltiness of the Canadian ham to be tangy and perfectly balanced. The pizza was cold, but the crust remained vigilant against sogginess. All in all, a solid hangover cure and delicious drink in one. We basically died and went to bloody mary heaven yesterday. The inaugural Chicago Bloody Mary Competition, held at Park West, featured bloody marys from 15 bars and restaurants from around the city. Your event ticket got you a 3 oz. bloody mary sample from each spot, passed brunch snacks, plus a chance to win raffle prizes and vote for the cocktail that would rule the city. Jam Productions is known for putting on concerts. So, why bloodies? Between sips, we were able to sneak in a quick chat with Brian Ferber, the brainchild behind the competition and event producer at Jam Productions. 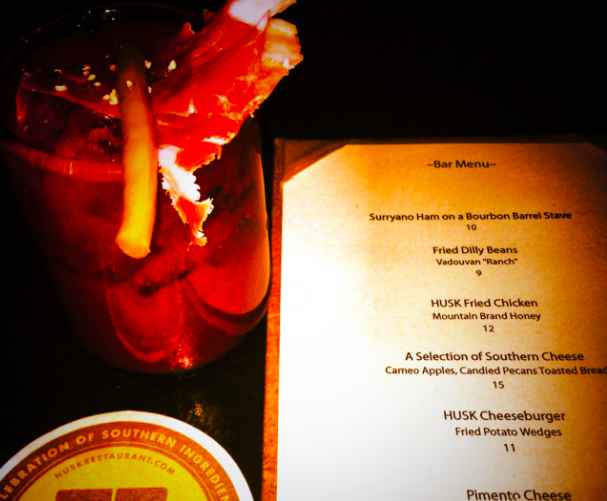 “There’s something broader than the bloody mary—it’s what Sunday Funday has become. People in Chicago like drinking during the day probably more so than going to clubs late night. I think it’s more relaxed. It’s Midwest. It’s Chicago, ” said Brian. There’s so many different things that could be done with the bloody mary. I felt like there was something there to tap into and bring that community together. 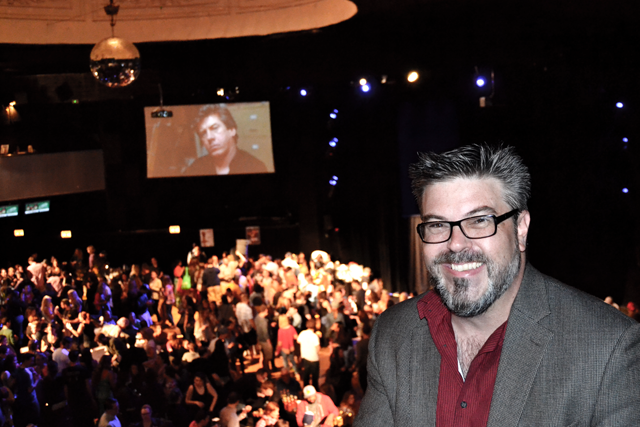 I was blown away by how fast our inaugural event sold out. With so many bloodies under one roof, we can see why tickets went so quickly. We could easily write posts on each of these amazing bloodies, but here are the highlights. This BBQ joint has been on our radar for some time. So much work, so little time. We were lucky enough to get a sneak peek here. This bloody has a robust flavor and includes an interesting mix of spices and rubs you might guess from a BBQ spot. This one won for garnish hands down with its blue cheese-stuffed olive, pepperoncini, cheese, adorable mini celery stick and more. Word on the street is there’s a garnish bar at the restaurant. We’ll see you soon, Bub. We haven’t formally reviewed Three Aces but half of this duo has had the bloody, so we knew it was good coming in. What sets this one apart are a few unexpected ingredients like bacon sriracha, fish sauce, garlic and hops pickle juice and Revolution Eugene Porter. The pickled veggie garnishes were well received as well. As if Three Aces’ patio wasn’t reason enough to go. Their Slip n Slider bloody mary, which comes topped with a White Castle slider and was featured on our Thrillist list for most ridiculous bloody marys, didn’t make an appearance. However, we give major props for Headquarters’ for taking a unique spin—a green roasted tomatillo bloody mary that included cilantro, lime, green apples and grapes. What. Also our pal Tim was the genius behind it. We love Sunda. We love the Sumo Mary. And basically anything Chef Jess creates. So we were stoked to see his crew’s latest creation, which will be launched at brunch soon. The mix is tweaked slightly and the garnish has a surf and turf angle, with a chicken foot thrown in for good measure. Look for this one on the menu soon. This bloody was the sleeper. We talked to owner Dean for a few minutes and his passion came through in this bloody. It has a memorable, distinct dill flavor that stood out from the rest. Yet another bloody mary destination we’re looking forward to trying. The fans voted. And the winner was…Fat Cat in Uptown! We knew this one was a strong contender right away. It instantly dwarfed every other bloody in the spiciness department, yet it had a sweet edge. Most likely due to BBQ sauce, if our palates are right. Plus, the bacon in the garnish was absolutely incredible. We’ve been but will be back for an official review soon. 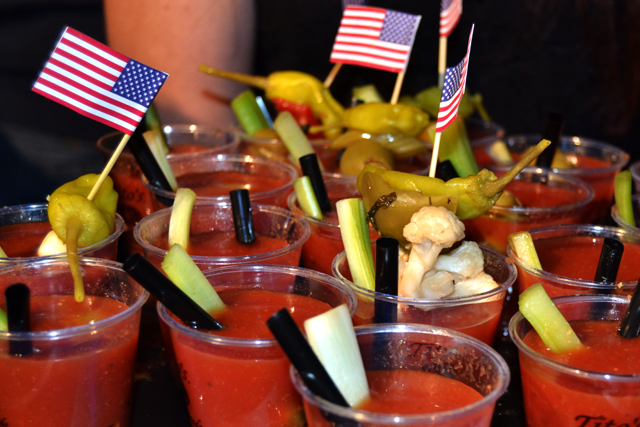 What an amazing event and array of bloodies. Will there be another one next year? “We’re not going to wait until next year. We’re going to do one in the fall,” said Brian. We like the sound of that. 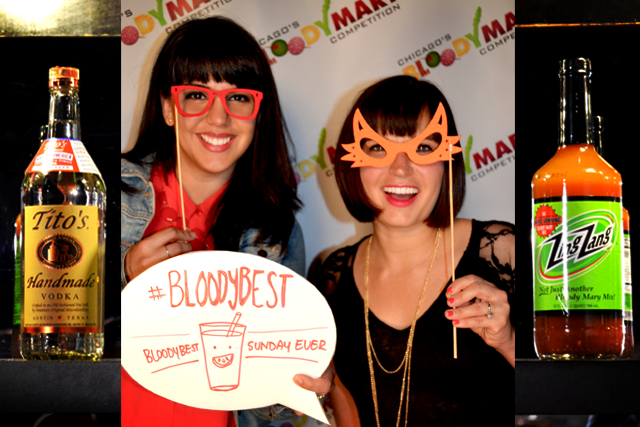 Chicago’s Bloody Mary Competition is on Sunday! The fact that it sold out super quickly says we’re not the only ones who love this amazing brunch cocktail. Duh. In fact, we’re not the only bloody mary bloggers out there. Truly. We weren’t the first and certainly won’t be the last. Luckily, these likeminded folks on a similar pursuit can show you the ropes in the bloody mary scene wherever you live or travel outside Chicago. 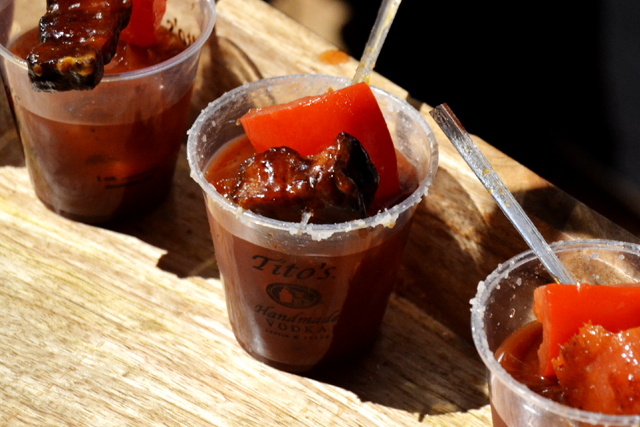 Here are five bloody mary bloggers we love and with whom we’d love to share a drink. 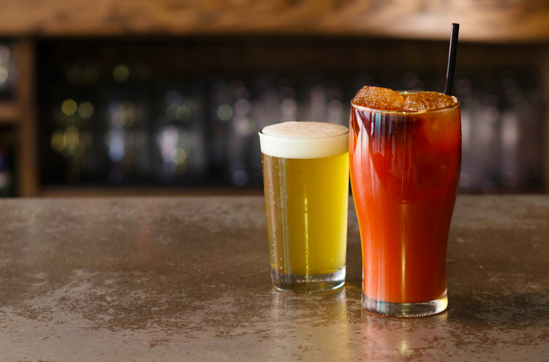 Based in the other city obsessed with the bloody mary, Milwaukee, Catlin Moyer gives you honest reviews of the bloodies in her fair city, served with a side of sass. Plus, she travels quite a bit (note: she works for a sports team) and gives you a taste of the bloody mary scenes in places like Arizona and SF. From what we know of her, we’d love to drink some bloodies with this girl. Shelley Buchanan means serious business when it comes to bloody marys. 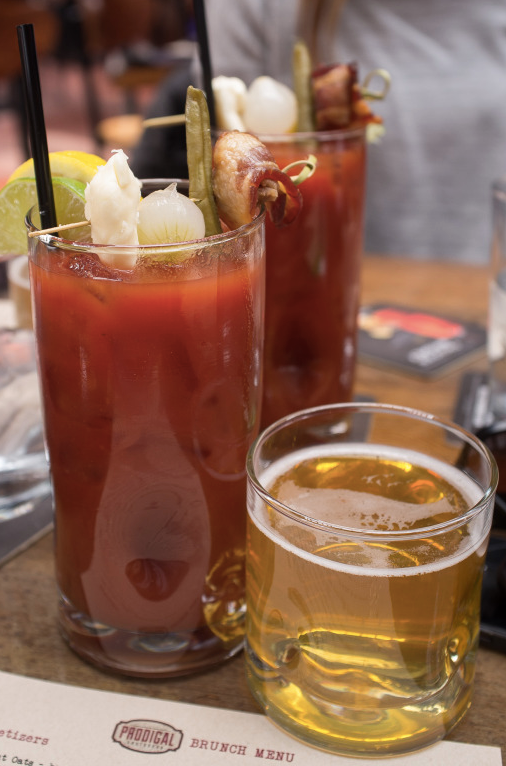 She’s your go-to resource for all things bloody mary in SoCal. She even recently published a bloody mary book of the same name and is taking her bloody mary empire nationwide. Plus, we simply love her “celery stalk” rating system. 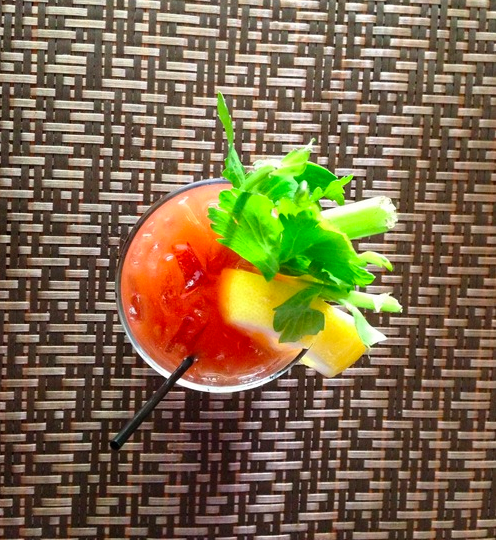 We love this blog because it’s a bloody mary and travel guide all in one. Our lovely tour guide travels for work and we get to benefit with reviews and travel tips from places like Atlanta, Salt Lake City, Las Vegas, Boca Raton, Seattle…and the list continues. 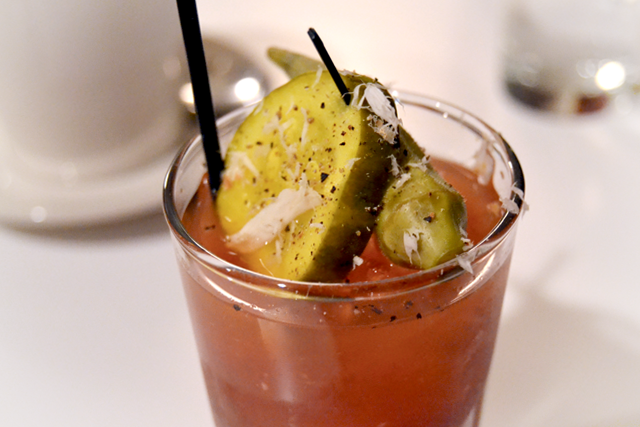 This Brooklyn-based bloody mary blog is a newer one on our radars. The photos alone make us want to hop on a plane to NYC and brunch in the boroughs ASAP. Shannon, who’s also a lovely photographer by trade, runs Bloody Marys of Milwaukee, another blog documenting this Midwest city’s love of our tomato brunch cocktail. Besides the delicious looking drinks, she has a handy guide to the best and worst contenders. Between this blog and Out for Bloodies, we’ve made Milwaukee a must-stop this summer. Honorable mention goes to fellow Chicagoan Jeff from Best Bloody Mary Blog. While we’re featuring out of town folks in this post, we hope to meet you at the Bloody Mary Competition this week. Any other bloody mary blogs out there we should know about? Shout them out. 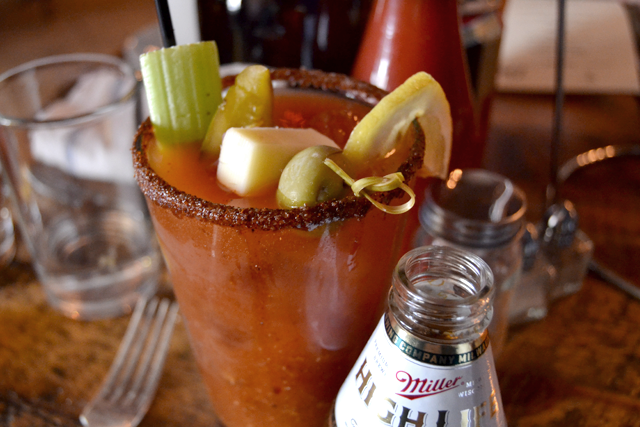 Happy bloody mary drinking this weekend, everyone! Note: Photography via authors of their corresponding blogs. Oh summer, you’re such a tease. You’re here for now after months of not showing your face. The sunshine and warmth are nice. Please stay. Luckily, for when the weather decides to play hard to get, we now have Summer House Santa Monica. Next winter (or even next week, who knows) when it’s cold and you can’t afford a plane ticket to the west coast, let Summer House be your airy, sunny (albeit short) getaway. Come meet your future cure for seasonal affective disorder. We’ve been dying to try this joint since it opened a few months ago. Hot, cold, whatever the actual season: this place gets busy. Luckily, we were able to belly up the the bar, where the brunch cocktails and food don’t play hard to get. At first sip, this bloody mary was decidedly fresh, briny and good. But different. We couldn’t put our tastebuds on it, so we consulted the bartender. Cumin makes the difference. We were quite taken with the garnish as well. Crispy bacon, cucumber, blue cheese stuffed olive, one standard green olive, celery, lemon and lime. A homerun if only there had been TWO blue cheese stuffed olives. The brunch menu has an array of healthier SoCal-inspired offerings such as granola, egg whites, spinach, avocado and kale. Of course, we went the more indulgent route. And after hemming and hawing about the roasted turkey eggs benedict or breakfast tostadas, we heeded our bartender’s advice and both went for the the breakfast tostadas. Because that’s how we do. And wow, no regrets. 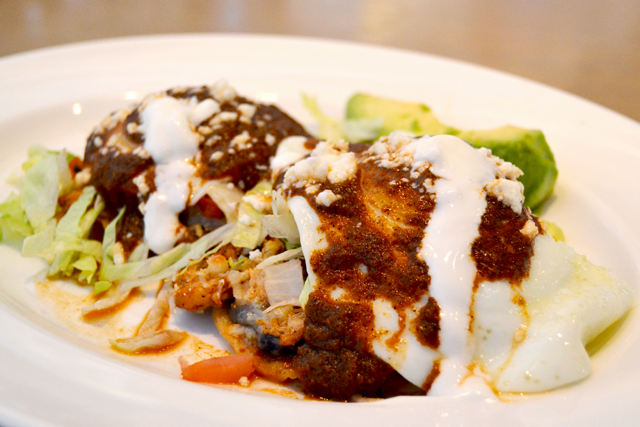 Pulled chicken with sunny side up eggs, avocado, queso fresco, ranchero, atop crispy tortillas. Holy crap, get this. So good. Well, you know where you can find us in the winter months: using Summer House as a SAD lamp and crying into our bloody marys about the cold. Or whenever, this place is great. Until then, we explore on. Hopefully on sunny patios. Cheers! We’re stoked to introduce our newest series, Summer Fridays. A laid-back way to start your weekend of brunching off right. For our first post, we’re offering inspiration for one of our favorite summer pastimes: imbibing patio style. Five drinks from some of our favorite cocktail and lifestyle bloggers come practically begging to be enjoyed outdoors. Ones we can’t wait to craft and enjoy in the name of summer. Here goes. We have girl crushes on the ladies at A Beautiful Mess. Everything they create is gorgeous and delicious. They’ve even inspired us to replicate the Blood Orange Bloody Mary and Carrot Bloody Mary. We can’t imagine this fizzy concoction with freshly muddled raspberries, lemon juice, limoncello and triple sec would disappoint either. A cocktail with gin, fresh grapefruit juice, rosemary simple syrup? Call us. Everything about this cocktail sounds fresh and (re)freshing. And Maddie is on the money—making simple syrup is maybe the easiest thing you’ve made. Go to the site for the cocktail. Stay for the aesthetically pleasing photography. 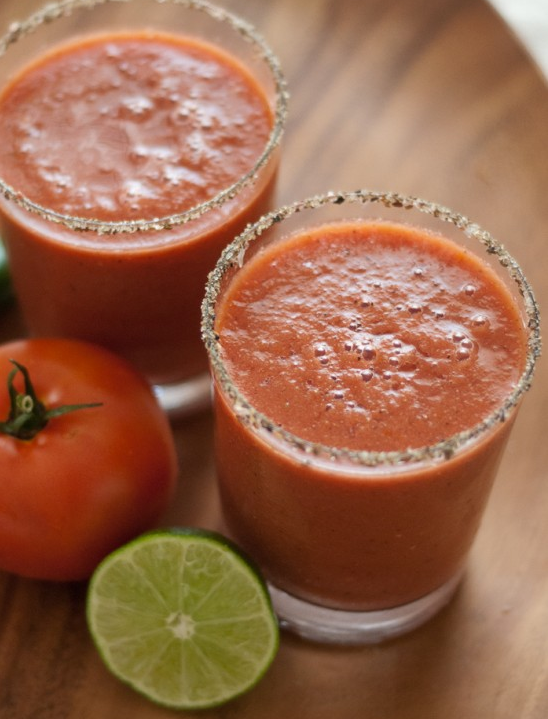 We have a thing for tomato-based drinks. Yeah. This sangrita seems to be a smoky, citrusy take on the cocktail after our own hearts. Also similar to a michelada, but made with harissa and an array of citrus instead of hot sauce. We also love that Stir and Strain calls itself a “cocktail scratchpad” in that Elana is putting cocktail ideas in pixels as a starting point for making them tastier. We’re typically red wine kind of gals, but white wine can woo us when it comes in the form of sangria. We’re interested to see what happens when you combine dry white with the floral of St. Germain and the oaky flavor of pisco brandy. Guess there’s only one way to find out. We also adore the calligraphy and emphasis on stationary on this site. Sure, you’re probably saying: Bon Appétit isn’t technically a blog. Touché. But they usually never steer us wrong gastronomically. This particular recipe is surprisingly simple for the magazine. It’s an easy margarita recipe with jalapeno that stays cool with cucumber. Here’s to the beginning of a fantastic summer, loves. For more summer cocktail ideas, check out our Pinterest board. Cheers! Note: Photography and recipes via authors of their corresponding blogs. 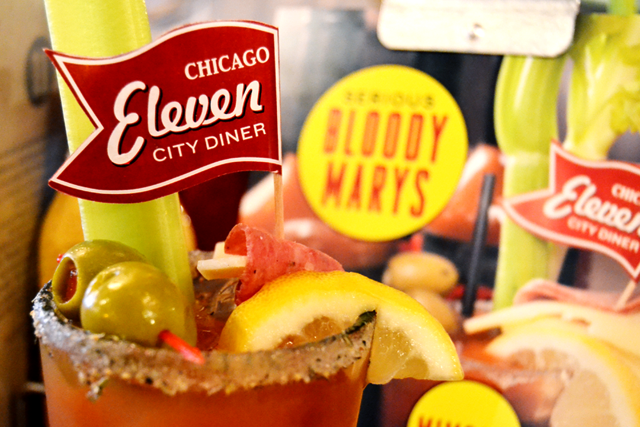 People always ask what’s our favorite bloody mary. This doesn’t come as a surprise. After all, we have a bloody mary blog. Some of our go-to responses include Twisted Spoke, Little Goat and Au Cheval, which are all consistently awesome and delicious. The ones you could drink over and over. The ones that could convert the non-believer. There’s another one that should be on this list. The Serious Bloody Mary at Eleven City Diner. We’ve had it too many times to count. For one of us, it’s a neighborhood go-to. It’s been there in desperate times of hangover need. Perhaps we’ve never reviewed it because DUH, WE ALREADY KNOW IT’S SUPER GOOD. But dammit, doesn’t deserve its time to shine? As mentioned, the Serious Bloody Mary is seriously effing good. Tangy, spicy, peppery and generous with the celery salt. It has a heavy, yet not-too-heavy, tomato taste. They’ll try to sell you on premium vodka, but it’s thick enough you don’t need it. Unless you’re fancy. The garnish aims to please with a celery stick, lemon, olives, salami and swiss. Plus, a cute Eleven City flag. Love it? You can buy the mix for around $7 and DIY at home. The food at Eleven City aims to please as well. 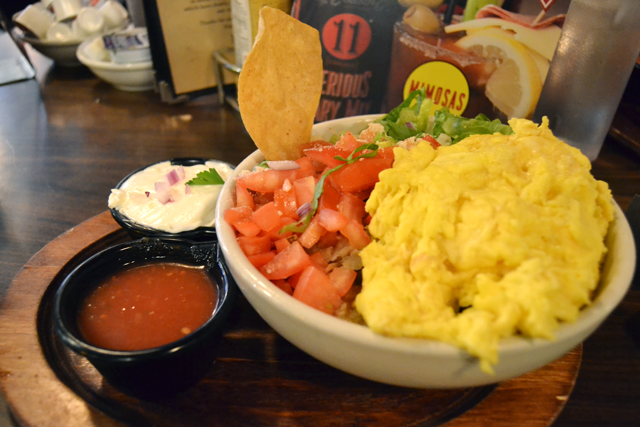 Menu options range from Jewish deli faves like bagels and lox to one of our faves, chilaquiles. We’re suckers for Mexican brunch fare, but these chilaquiles are done particularly well. They get slightly soggy as they should and perfected when you add salsa, sour cream and a ton of Cholula. Other stand-outs are the matzo ball soup, Coco’s Eggs and the new breakfast sandwich. We’ve never been to the newer Lincoln Park location, but we can imagine it has the same tasty menu and 50s crooner and big band music. Eleven City Diner is located at 1112 S. Wabash and 2301 N. Clark. We didn’t make it to Mardi Gras. Or JazzFest. Something tells us even if we had, the highlight of either imaginary trip would have been the food. We found the best known Chicago substitute for Big Easy eating in the form of brunch at Big Jones. And we’ll take any excuse to wander about the quaint streets and charming shops of Andersonville. It’s the adorable neighborhood either of us might live in if we were real grown ups. As you might guess, Big Jones has a distinctly Southern flair. The brunch menu, as you might also guess, features dishes abounding with shellfish, grits, greens, biscuits and Cajun flavors. The bloody mary at Big Jones was no exception. We liked it because of its freshness and simplicity. 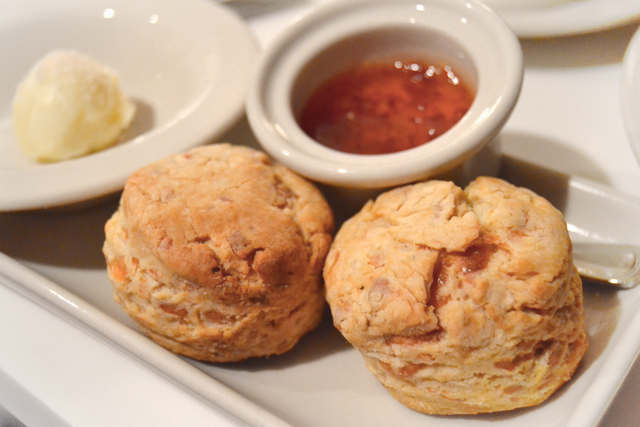 Like much Southern fare, it doesn’t try too hard because it doesn’t need to. Lemon and Crystal hot sauce flavors take the stage, so the taste wasn’t too, shall we say, “tomato-y.” Just simple, slightly spicy, and delicious. Hot sauces have become a topic of interest lately because they’re not just about different peppers and varieties. Each seems to have a local tie. Crystal, for example, is the “#1 hot sauce of Lousiana” adding cayenne pepper and a distinct vinegar flavor to this bloody. Also guest starring was housemade worcestershire and fresh horseradish. We also appreciated the delicious simplicity of pickle and okra garnish. Now the food. 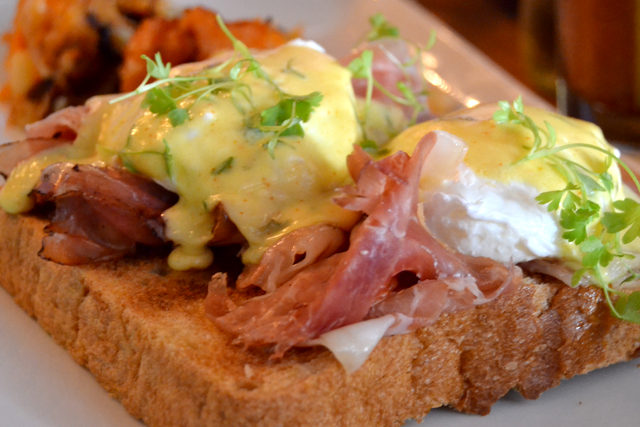 We understand why Big Jones often makes the best-of-Chicago brunch lists. We get it, big (Jones) time. 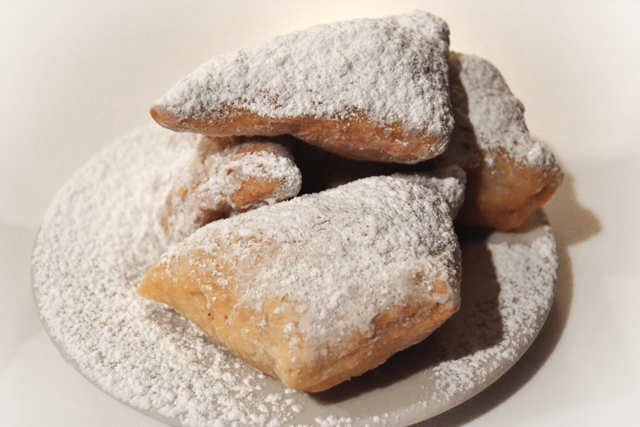 For starters, literally, you get complimentary beignets with your meal. Light, warm, fluffy and slightly sweet and savory. These were gone in minutes. Had we known about the complimentary beignets, we may not have ordered the biscuits as starters. Or maybe. The menu said they came with a blackberry jam, but we were pleasantly surprised with this hot peppery jam that played nicely with the slightly sweet biscuits. Carbs. If we didn’t have enough carbs already, we BOTH ordered the corn griddle cakes. They’re two savory corn pancakes (with cheddar in between! ), topped with spicy green tomato salsa, two fried eggs, avocado and sour cream. With loads of black beans. So, so good. So good. 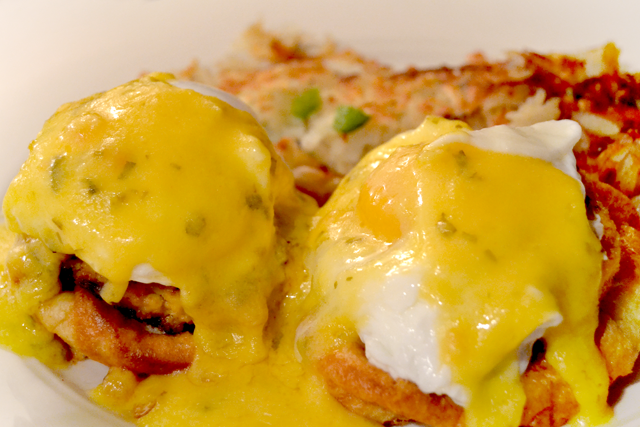 Our brunch guest Theresa ordered the Eggs New Orleans that comes with crab cakes, poached eggs and bearnaise sauce. I mean, come on. 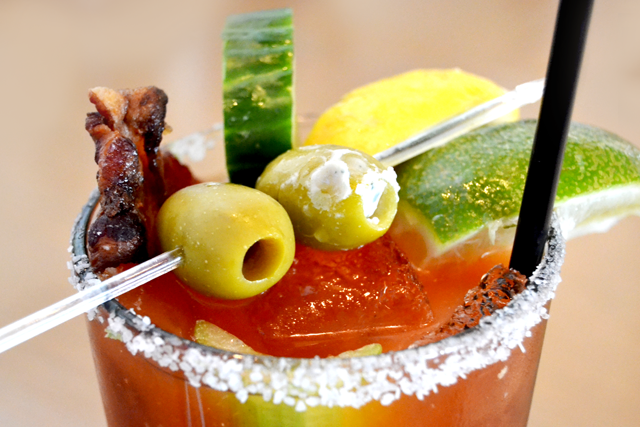 We can’t say enough good things about this bloody and brunch. We’re already Jonesing to go back. Until next time, friends. Happy brunching. After months of hearing and talking about it, this actually happened. 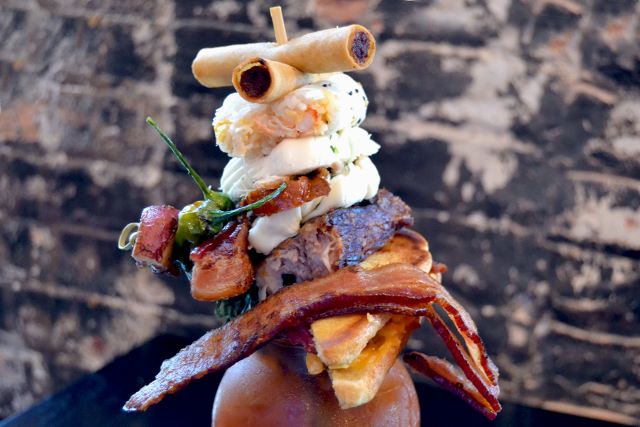 The Sumo Mary, a massive bloody mary that requires bold feats of brunch wrestling strength. We first heard of it from fellow brunch enthusiast Gourmet Rambler. 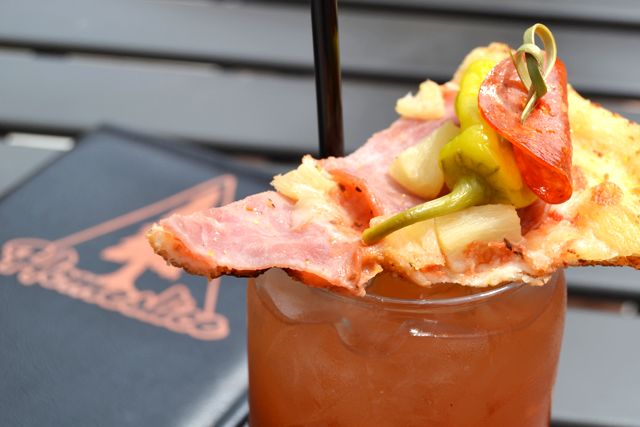 We listed it as Chicago’s most ridiculous bloody mary on Thrillist. We got acquainted with it on Windy City Live! It was time to get to Sunda and experience its magnitude for ourselves. We’re gonna be completely honest for a second. Bloodies with crazy garnishes get lots of attention, but we don’t buy the hype. The gimmick often overshadows the flavor of actual cocktail. This isn’t the case with the Sumo Mary. We were blown away by the taste. Hyperbole warning: it’s one of the best we’ve had this year. It’s 32 ounces of refreshment with generous cilantro and cucumber flavors. Plus, according to executive chef Jess Deguzman, it also includes a Vietnamese dipping sauce Nước chấm, a garlic vinaigrette and Japanese citrus fruit yuzu, giving this bloody mary its unique, distinctly Asian flavor. Now for the reason we’re all here: the garnish. Chef Jess created this bloody masterpiece using ingredients he already had in the kitchen. Are you ready for this? It consists of a baked Alaska crab roll, Chinese duck bao bun, a piece of thick braised pork belly and grilled cheese with tochino (Filipino sausage). Then comes all the side items: oshinko (Japanese pickled radish), roasted potatoes, shishito peppers, loompya (Filipino egg roll), Chinese broccoli and four piece of bacon. This bloody mary isn’t for the faint of heart, and neither is its price tag at $40. But when you think about it, it’s a good value when you consider you’re getting essentially two bloody marys and a meal. 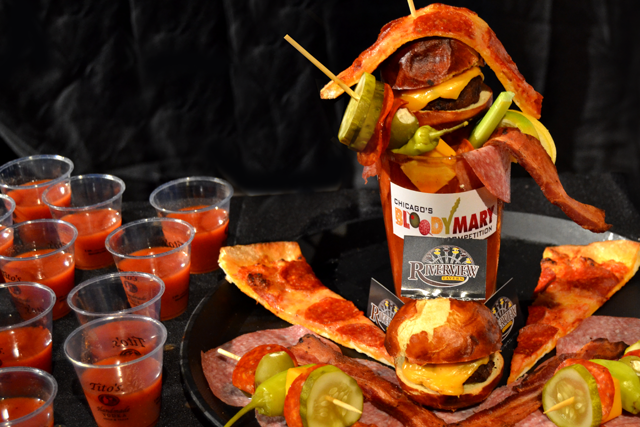 If this is too much bloody mary, you can also get a standard size and create your own garnish selection via their bloody mary cart. To be honest, we were pretty stuffed after wrestling this bloody. 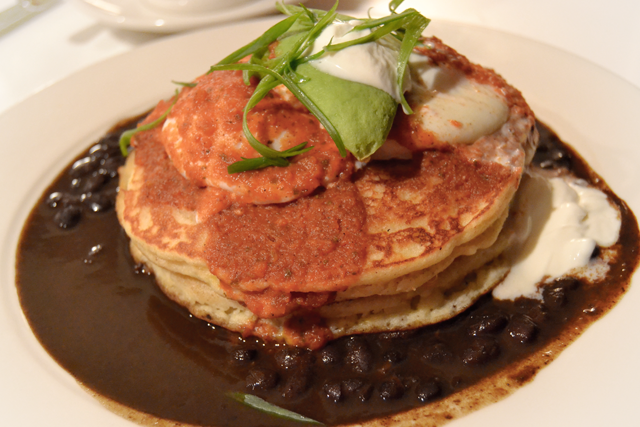 That didn’t stop us from seeing what the rest of Sunda’s brunch menu had to offer. Brunch is where “east meets west,” with offerings that range from Asian-inspired brunch dishes to sushi to dim sum. 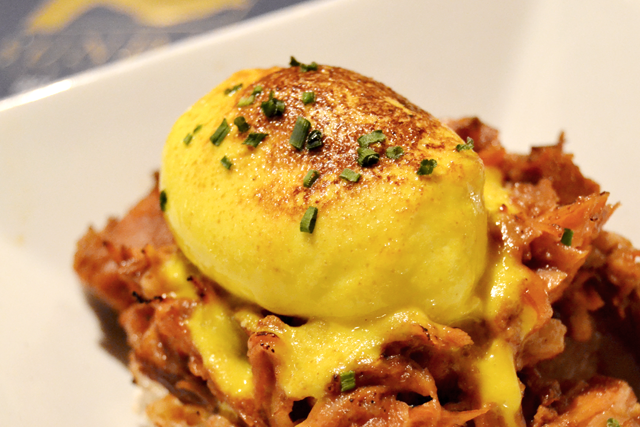 We tried the braised pork belly on rice patty, which is an Asian spin on an egg benedict. The pork was incredibly tender, smoky and savory, and the crispy rice was a surprisingly amazing alternative to traditional English muffin. Sunda makes for the perfect spot for the group that likes to order and try a bit of everything. 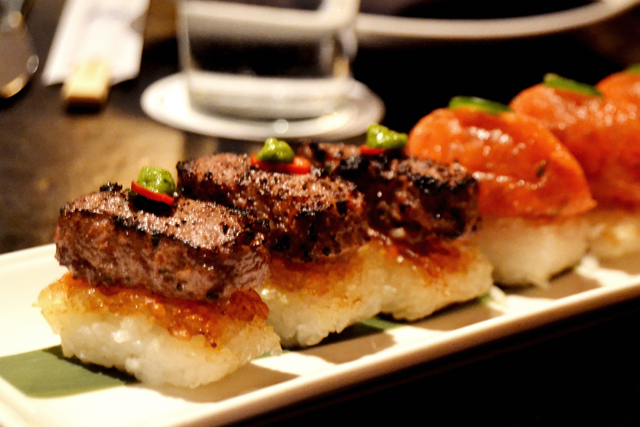 The classic crispy rice with spicy tuna and seared wagyu tartare were standouts that both came with a spicy jalapeno kick that’s enhanced with the crunch of the rice. 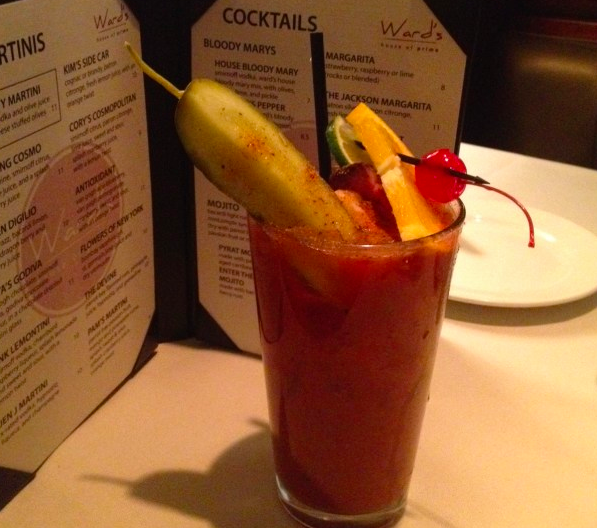 Come for the bloody, stay for the Sunda’s brunch. 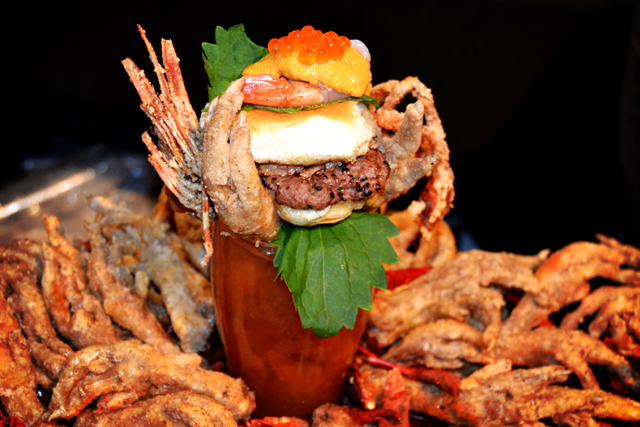 Don’t let the over-the-top garnish fool you, the Sumo Mary is the real deal. It’s a bloody mary we could drink again and again. And hope to.